A total of 26 wildfires burned in DNR Protection Areas over the past week, burning 73 acres. Half of the fires were caused by debris burning. Eleven buildings were threatened and one was destroyed. Widespread rain and snow then lowered fire danger across the state. The safest time to burn leaves, brush and pine needles is when the ground is completely snow-covered. Spring is wildfire season and it’s important to remember that storm systems bringing snow and rain give a short reprieve in fire danger. 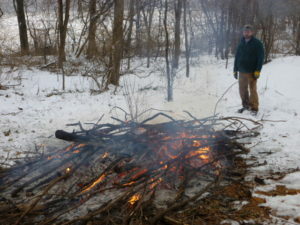 While burning debris should always be your last alternative, the safest time to burn leaves, brush and pine needles is when the ground is completely snow-covered and will remain so for the duration of the burn. As we dry out, expect fire danger to increase. There is plenty of dead grass and fallen leaves on the land that makes it easy for a wildfire to start and spread. Stay apprised of fire weather conditions by checking the DNR fire danger webpage each day after 11 a.m.: dnr.wi.gov, keyword “‘fire”. Firewise Tip: Remove leaves and other debris that has accumulated next to buildings, in lawns, and on and under decks. Take special care to clean out dead material from evergreen shrubs near buildings. Compost these materials or take to a leaf collection site.